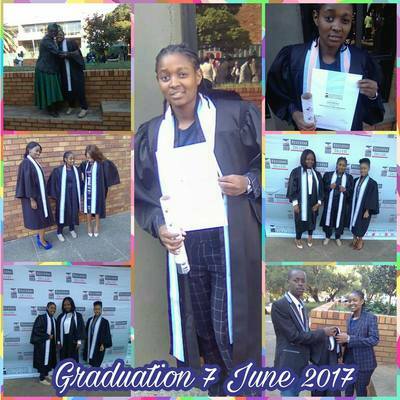 Lerato and Iris were two of the first bursary recipients and they have really set the bar for all who follow. Both are now working in the corporate sector, earning fixed salaries and becoming independent, contributing members of society. They are able to provide not only for themselves but also to help members of their families with essentials like food, shelter, clothing etc. In addition they have both committed to working with the youth at the community centres in their respective informal settlements, encouraging them to go to school, helping with homework, computer literacy studies, knowledge and life skills sharing etc. They have effectively become role models for the youth. You see, whilst we strive to make a difference one life at a time, the knock-on effect is astounding. 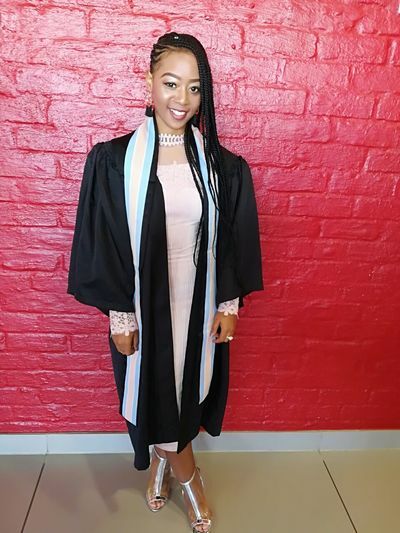 Ambrotia is our newest graduate, she stepped up to the plate and literally hit a home run in year two earning 6 distinctions. We really are immensely proud of what she has achieved. Both Ambrotia and Iris need your help to get appropriately placed. Although employed, Iris is not currently working as an assistant but really would like to put those skills to good use and is very passionate about the profession. So if you or anyone you know is currently recruiting junior admin staff or have intern opportunities available in Pretoria/Midrand/JHB area please get in touch. Our 2018 students are settling in well and although they are navigating the challenges of formal tertiary education and some subjects that are totally foreign to them (Office Finance), they are already impressing with their academic results. We know it will require hard work and unwavering commitment but we believe they have what it takes and look forward to celebrating more success stories at the end of the year. All of our students (past, present and no doubt, future) achieve against the most incredible odds … living in informal settlements, no electricity, no running water and very often, no food and a minimal family support structure. To see what they achieve is truly humbling and we salute each and every one of them. We have a fantastic, committed team of mentors Susan, Cathy and Li-Ann without whom this project is impossible. We are 100% reliant on donations and 100% of the funds raised go to the students. First and foremost we pay for the formal education including textbooks. The number of bursary recipients each year is limited by the bank balance. If there are additional funds available we try to assist with other essentials like transport, mobile phone airtime, food etc. ​As our first birthday has just passed we would like to share our journey thus far with our supporters and friends. We started out as a group of very committed and passionate assistants who wanted to make a difference, no matter how small. We felt that there was so much complaining and negativity about the state of the world, the economy, poverty and unemployment (5 million young people unemployed in South Africa alone), but no concrete action beyond that. South Africa was also plagued with violent student protests about the cost and access to education. It is natural to think “but I am only one person, how can I change anything?” We feel like we cannot influence the world in a meaningful way as an individual or even a small group. We however, decided to change our paradigm on what and where we focus our energy. The questions we had to ask ourselves included, what can we do? Where do we start? What do we care about? What do we want our legacy to be? And that friends, is how the journey began! So a team of beautiful souls set off to make a difference. We were naïve at times, not everything went according to our plans, we faced challenges, red tape and disappointments but if you ask any of us if it is worth it, then you will get a resounding YES! Two of our students from the 2016 intake have done incredibly well and their success has motivated us to keep focused on changing one life at a time. Iris Mothwa has made us very proud. She started off as a quiet, slightly withdrawn young lady. We had concerns about her, wondering if she would be able to interact with people as assistants do daily, however we found her situation so compelling that we could not turn her away. You see, Iris is the head of a child household, she is the provider for her 4 siblings and we knew that if we gave her this opportunity it would change her life and employment prospects forever. Iris has not disappointed, in fact Iris has blossomed. She has worked exceptionally hard and achieved amazing academic results. She has grown in confidence and has said to us that she wants to inspire her siblings to make something of their lives. She has stolen our hearts and she has become a daughter to all of us. We are currently giving her more work exposure in the hope that she will be successfully placed very soon. We do not doubt she would be a wonderful, responsible and mature (way beyond her years) addition to any company and hopefully we will be able to share that good news in the very near future! Our second incredible student is Lerato Sikhosana, a petite but feisty young lady. We will never forget the first day we met her. Those big glasses and even bigger smile. When we met she was doing people’s hair on the weekends to make ends meet and volunteering during the week at Orange Farm which is a township near Johannesburg. During the interview, we asked many questions and saw her face light up several times, but the excitement in her eyes when she talked about her ladies soccer team (of which she is the captain) was absolutely electric. Well, they always say that sports help you develop discipline and in this case it rang true. Lerato kept her eyes on the goal (pun intended) and has blown us away. 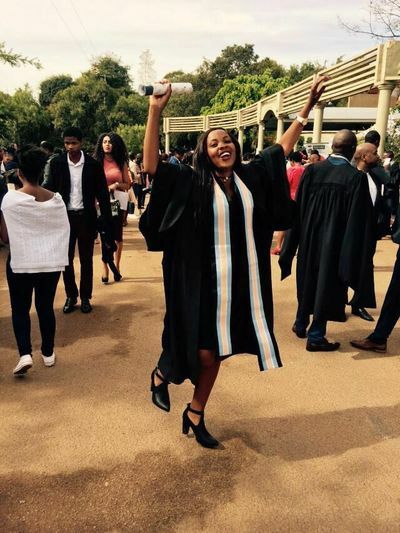 She not only completed her studies successfully but during her work experience week she made such an impression that she is now a full time employee with this company. Like proud mamas (Moms) we must brag a little…she only OFFICIALLY graduates in May 2017, she will need to take leave to attend her graduation ceremony. Having an income means that Lerato has now moved into her own place. She proudly shared pictures of her new abode and we all agreed that a house warming party was in order. It is amazing how a life can change in a few months. This little bird has taken flight and we are so privileged that we could play our part. Was it all smooth sailing? Nope! We had two students who did not successfully complete the year. The circumstances are irrelevant here but the situation was utterly devastating to the team. It made us question if we did enough, if we are skilled and experienced enough to handle a passion project that is this complex, with individuals facing such tremendous odds. Many tears were shed, lots of hard discussions had, but we grew, it made us stronger and most importantly we learnt some hard but important lessons. So, year two! Well we had to sort through 328 submissions but sadly only found two candidates that qualified in line with our criteria, but as a team, at the outset, we made a conscious decision to focus on quality over quantity as we view this project as a long-term commitment. Our newest recruits had their orientation day on the 7 February 2017 and will start their exciting academic year on the 13th of Feb. We look forward to seeing Rosina Molamodi, Andile Mthimunye and Ambrotia Molelewa achieve and grow this year and beyond. We have been so overwhelmed by the generosity of the PA community globally, the trainers and the companies as well as individuals that came on board during 2016 and continue their support in 2017. We are blessed beyond measure that we are surrounded by those that have become fondly known as Isipho Angels! Many times, in 2016 we felt that the mere words “Thank you” were just not enough. When we were in need, someone always came forward to support us and for that we are so grateful. The overwhelming feeling we are left with, is that people are actually good, they really do care and if you ask for help, people will support you. What an amazing take-away for us. If you feel that you would like to contribute financially to this cause you can visit our funding page at https://gogetfunding.com/isipho-admin-bursary/ every little bit makes a difference and together we can achieve something incredible.